1. Cut the salmon into 6 pieces. 2. Place all pieces in a plastic bag. 3. Add the flour, salt, and pepper and shake to coat well. 4. Discard the unused flour mixture. 5. Heat the oil in a large skillet. 6. Brown the salmon pieces lightly for 2 minutes on each side. 7. 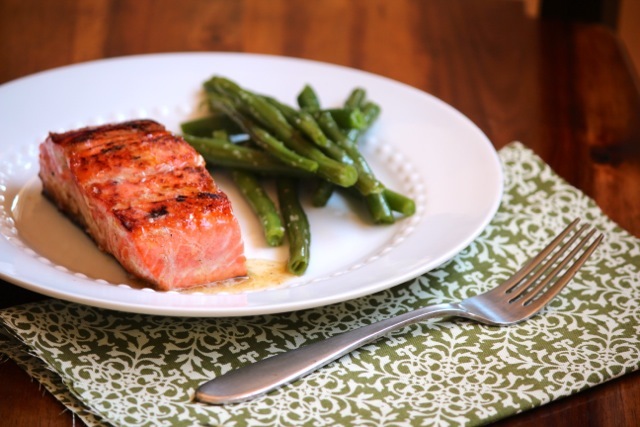 Remove salmon from skillet and place on a plate. 8. Add the water, chicken broth, lime juice, and capers to the skillet and bring the mixture to a boil. 9. Stir well and add the salmon back to the skillet. 10. Reduce the heat and cook the salmon until done, about 5-10 minutes. Serve with a side of green beans and garden salad.